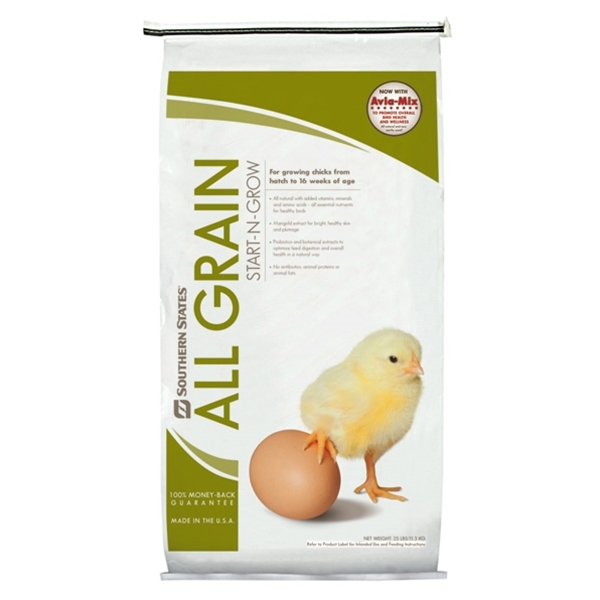 Southern States All Grain Start N Grow is an all natural 18% protein feed for growing chicks. This feed has added vitamins, minerals and amino acids for growth, muscle and feather development. Southern States All Grain Start-N-Grow is free of antibiotics but does incorporate a pro-biotic which optimizes feed digestion and overall health in a natural way. This feed includes marigold extract for a bright, healthy skin and plumage. Feed ALL GRAIN START-N-GROW free choice to starting chicks. Provide fresh feed and water to chicks on a daily basis.